Update 09-27-2017: I scrapped OneLink and went with AAWP. Read more about that on Should I buy AAWP (Amazon Affiliate for WordPress) Plugin?. Or continue reading for all your options for link localization. 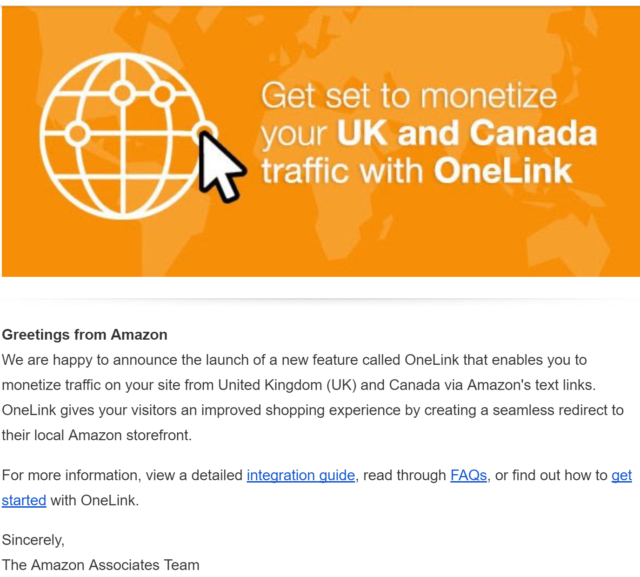 If you use Amazon’s text links, you can now monetize international traffic coming to your website from the United Kingdom (UK) and Canada. Here's more information about OneLink. The article below discusses options for Amazon Link Redirection Software, none of which I've started using yet because I wanted to do my due diligence about any potential risks of using the software. I see no apparent risk of using a service that Amazon itself directly offers, and so for the time being, I'm going to move forward with OneLink. 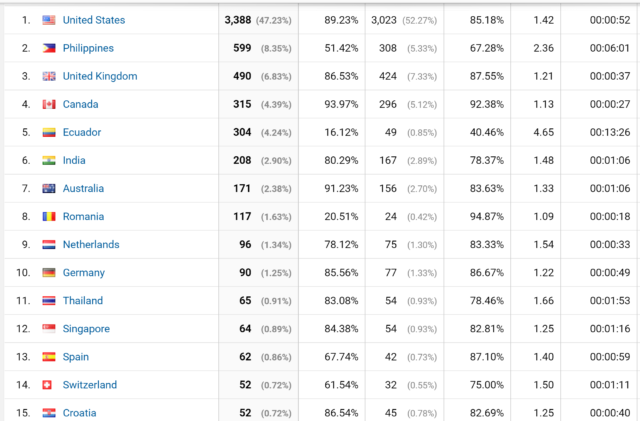 It doesn't cover EVERY country that my readers come from, but it does include UK and Canada which are two of my top countries as you can see in the screenshot below. As you can see from the screenshot below, a healthy portion of traffic from my website (about 44%) comes from countries outside of the USA. And much of that traffic is for articles that generate income via the Amazon Associates Program. So you can see that I'm currently missing out on any revenue from visitors outside the USA because they are clicking on my Amazon affiliate links and arriving at the Amazon.com version of the website instead of their local version (like Amazon.co.uk for example). For this I need an Amazon Link Localizer (which often goes by different names). Call it intelligent links, link localization, global linking, universal linking or link globalization. It all essentially means the same thing in regards to the Amazon ecosystem: the ability to use a single Amazon affiliate link that will work seamlessly for all of the different Amazon storefronts and Associates programs. I've been hesitant to purchase any 3rd party software until I fully understood how they worked. Remember that the companies that provide these services or plugins aren't endorsed by Amazon, so they will gladly take your money for software but can't guarantee that using their software won't get you banned now or in the future. Now that my website traffic has become a bit more substantial, along with my site income from Amazon Associates, I see that I can in theory almost double my Amazon Associates income through link localization since much of my traffic is international. The time is right to research and make a decision on which software to go with. Below is an account of my research. EasyAzon.com – Probably the most hyped plugin available, but I take that with a grain of salt because most of the hype is from affiliates. They've got some big names using the software like Spencer Haws and Brandon Turner, both who I follow their blogs, but even so I'm always skeptical. They offer some advanced features like link cloaking (which isn't that against the Amazon TOS?) and automatically adding to cart which gets you an extra 89 days of potential commission on the item (which I freaking hate when people do because I clicked to see the item, not have it put into my cart and it adds an extra step for me as the visitor). Something seems so “Internet markety” about their website and I've been hesitant to jump on their bandwagon. EasyAzon is $67 for their Developer version. What I've learned about EasyAzon which may be a downfall is that they use their own version of links, which are similar to shortcode. So you would have to replace all your old Amazon links with their special links. And then if you ever decided to switch off EasyAzon, you'd have to go back and change them back. Granted you could test the software on NEW articles only and see how you like it, but that defeats the purpose. If I begin to localize my links, I'd like it to internationally monetize my posts that are already ranked and have consistent traffic. Geni.us – This is the next software I found out about. And I saw that they are actually mentioned on that Amazon link I posted earlier in this article. A far more appealing option for most Amazon Associates is to use a third party intelligent link management service, like Geniuslink, Amazon Link Engine or SkimLinks. Geni.us has three pricing plans: $9 / $99 / $499 per month depending on the number of clicks your website receives. And of course they include additional features with their more expensive plans. I learned that they redirect all link traffic through their servers, which is fine as long as their servers are up and running, which according to their blog, they are pretty consistent. They also work with more companies than just Amazon, which at the moment isn't a big deal for me because most of my affiliate links are either for Amazon or direct affiliate links to individual websites that host their own affiliate program and ship internationally. Similar to EasyAzon, I'd have to replace all my previous Amazon links with my special Geni.us links. Update: See comment below this post from Jesse @ Geni.us. This company seems legit but I'm afraid it might be overkill for what I'm looking for at the moment. They also boast some big name users like David Peterson, Pat Flynn, Ryan Holiday, and they even say Niche Pursuits (which I thought Spencer was using EasyAzon? has he switched or does he use both on different site?) However, I'm a fan of doing things the right way from day one even if it costs a little more to get started as it often pays off in the long run. They offer this plugin called Amazon Link Engine for free, which automatically localizes your Amazon links (only without inserting your affiliate code). This is great for your visitors. Even if you don't earn a commission, at least your international visitors are happy because they land on the Amazon site they need to make a purchase. Although I can't imagine the need for it when you can just spend a few bucks on software that does the same job and also lets you earn. I'm thinking it's just a free lead gen product to bring your attention to Geni.us from the WordPress Plugin marketplace. I just came across your website and found the list of ———-. Great list! The ———- looks great. If I buy ———-, I’ll definitely make sure to click your affiliate link to show some appreciation for your work. I was visiting your website from the UK and got sent to the USA Amazon store when I clicked on the Amazon link. It looks like you are not using a localizer for your Amazon links. I know a few people that are earning some great beer money just from displaying localized links. In case you don't know, a link localizer changes the Amazon affiliate links based on the location of the visitor, meaning that a visitor from the UK will be sent to the UK Amazon store and a visitor from Germany to the German Amazon store. Are you currently using something like that? At first I thought he was just a helpful reader with experience in the Amazon affiliate game and reached out to provide some assistance. To be honest, I do stuff like this all the time. Oftentimes people will reach out to me for one thing and after I view their website, I end up offering all sorts of unsolicited advice. Or at least twice a week I notice something broken or that could be improved about a blog or website and I send the owner a quick note. So I thought Stan was doing the same. But then I noticed that he was e-mailing me from his @flovidy.com address so I checked out their website, which to no surprise, sells a link localizing WordPress plugin. Was his method of cold e-mailing me shady or brilliant? I mean, let's be honest, he has no intention of purchasing the ———- product I mentioned in my blog post. I'm sure his marketing game is finding Amazon affiliates without link localizers and sending them the same e-mail with the blanks filled in on their blog post and their products. But it worked and got my attention, so respect. Plus, he's been great since then answering all my questions about their product, which their website still needs some work in my opinion getting across. I'm a technical-minded guy and so while their website says WHAT their plugin does, it doesn't go into enough detail at the moment about HOW it does it. I also recommended in one of my e-mails that he makes product comparison pages comparing his software to his biggest competitors. That would go a long way. Right now I'm waiting to hear back from Stan on an e-mail I sent him earlier today asking a few follow-up questions. Their software installs directly onto your site and doesn't redirect traffic to their servers like Geni.us. And they work with your existing links unlike EasyAzon. Flovidy charges $69/license or $99 for 5 licenses. Other than that, I don't know anything about the company itself or the developers behind it. But I asked, and I'll update this article and let you know when I do. Update 6-13-2017: I asked Stan a few questions via e-mail and here were his responses. 1. What's actually happening behind the scenes? If you're not referencing your own servers like Geni.us, how are you cross-referencing the product URL (USA) with the product URL (UK)? Or is it simply replacing the “.com” with “.co.uk” and the affiliate tag, which seems to work in many cases? I will share a bit of the technical details, please let me know if there are things that you don't understand! Let's say you installed Flovidy. Once a page has loaded, it will find all the amazon.com and amzn.to links on that page. Those will be sent to the backend and then will be changed to the URLs that fit the visitor's country (if the visitor is from a country where Amazon does not exist yet, it will show the normal US links). It will change the top level domain (“.com”) and then it checks with Amazon if that link exists. If the product does not exist, it will create a search link. The vast majority will work with the ‘.com' swapping. The rest will be changed to search links. The links are saved in your database, so they can be shown quickly and don't rely on some other server. 2. Does it work with the shortened versions of the links ie: amzn . to / abc123 (put spaces so it would not auto-hyperlink) or would I have to change my previous shortened links to the Full Link? Yes, it does. For the USA and other countries that don't have an Amazon store, it will stay the same amzn.to URL. 3. How new is Flovidy? Who's built it and what are they're backgrounds? These are things I like to know before getting started with a software that plays such an integral role in my income. Flovidy is now a few months old and was built by myself. Some of my friends are in the affiliate marketing business and didn't like EasyAzon. I just wanted to help them out and developed Flovidy. The much easier, simpler and lightweight solution. Now a few months later it has grown into a business. Since day one, my friends have been my beta users helping me fully debug this plugin. Right now, I have a handful of paying customers and haven't had one request for a refund. I also have a bachelor degree and a background in software development. If it helps, I also build chiefonboarding.com. Bestazon.io – I just learned about this software when I was Google searching “EasyAzon vs Geni.us” and this software was also being compared by someone. They charge $7/mo or $72/year. Or their software is free and you give up 3/100 of your clicks and donate the income to one of their non-profits. Personally I'd rather make the income myself and donate to the organization I choose. They say that their flat fee pays for itself if you earn more than $20 through Amazon Associates. Do they mean per day? I don't know. Either way, I'm past the threshold where I'd give up 3% of my Amazon clicks to save $7/month. Skimlinks.com – These guys have been on the block a long time, but they are probably out of my league at the moment because it looks like an Enterprise solution. They offer a lot more than Link Localization for Amazon, which seems to be just one of many feature they offer. They take a percentage of your commissions in exchange for their services. Viglink.com – Another service that's been around for a while. They automatically scan your website for keywords relating to products and insert affiliate links of programs that you're active in through their service (Amazon being one of many). They take 25% of your commissions in exchange for the service, however, they often place you into higher commission tiers based on their volume. This is not something I'm interested in using at the moment. For now I'm just after Amazon link localization. Which link localization software are you going with? I've almost ruled out EasyAzon but mostly due to some really harsh non-affiliate reviews I've read about their customer support and their software itself. Some people say it only works half the time. Geni.us is still in the running because they seem to be all over support. I see them everywhere on forums and their software documentation is up to par. It'd be a pain to re-do every link on my site (only to have to potentially re-do it again if I don't like the service), but it'd be a one time job. They seem to be a company that's going places and it'd be nice to set things up the right way with link localization from day one. I may not need all their services now, but in the future, it'd be nice to have additional affiliate channels to localize links. Plus it adds some credibility that they are mentioned by Amazon along with Skimlinks. BestAzon seems very straight forward, but if I'm going to spend $7 a month, why not spend $9 and get rolling with Geni.us? Flovidy I don't know enough about yet. My opinion could change as I learn more about the longevity of the software and who's behind its development. Skimlinks and Viglink at the moment aren't something I'm interested in. Most of my product features, reviews, and comparisons are very specific to certain products, so an automated link building solution isn't something I feel I need. It'd be different if I had a huge blog with thousands of existing posts and was starting from scratch with monetization.. either of those might come in handy. But for right now I only need to link to Amazon products or other specific affiliate programs. If you're reading this and have some feedback, be my guest. I'll update this post after I make a decision. I wanted to reach out and let you know that we just launched a new pricing structure with the goal to help our clients become better marketers. We no longer have multiple “plans.” Now, Geniuslink users simply pay for what they use in buckets of 1,000 clicks for $2 each. This new pricing model also gives all of our clients access to the same set of powerful tools that our larger clients get to use without having to pay a price that is out of line with the number of clicks they’re using. We believe it’s a win/win with more features for more users. Again, thank you kindly for the mention and consideration of the Genius Link service! Thanks for following up with that info. I could feel your pain as you went thru this whole process! I’ve been wrestling with it as well. My two cents is that BestAzon was the simplest and cleanest that we tried out. And that after the time spent wrestling with other option was a lovely thing! And yes, they do have some reporting/tracking to help you out. You are right that the guys at Geni.us are supper supportive and helpful! In fact, I felt like I knew Matt who helped me out personally, we chatted so often. 🙂 You do have to keep an eye on things and make sure that the links are up and working as we ran into issues with that. We ended up having to remove all the links b/c our conversions fell off a lot. 2. We DO NOT use our affiliate tag ever. For 3/100 of clicks (if you are not subscribed to flat fee), we use affiliate tags of one of renowned non profits supporting great causes. This is our way of a) doing good and b) incentivizing webmasters with significant enough Amazon revenues to subscribe. The comment above got that wrong! 3. With regards to GeniusLink teams comment above (that the comparison on the page http://support.bestazon.io/bestazon-vs-amazon-link-engine/ is inaccurate, I’d love them to provide with a factual response! If there is any inaccuracy in the comparison, we’d love to know and correct that. As far as we know, every single point on that comparison table is accurate as of today. They do provide generous affiliate payments resuting in inflated reviews, they do not integrate with GA, They do require you to register on their website to have intenational links with affiliate tags. Would love to ask them to clarify which one of these points is inacccurate! 4. On your “doubling the amazon revenues” comment, I guess the comment above does a good job of keeping expectations in check. We have found the number to be closer to 30% for most website instead of 100% increase. You can use this calculator (http://support.bestazon.io/universal-amazon-link-worth/) to get high level idea. Thank you for reading and clarifying. You’re right, the analytics that you offer is not made very clear on your website currently. I think a few testimonials on the site and some information about the company and developers would go a long way too. When I saw your site, it was easy to see that this could be a solution, but not much info about why it should be my solution, versus other software in comparison. Just some feedback from someone in my shoes who still hasn’t made a decision yet or started with any software yet. I like to know about the developers and the company I’m working with. I’ll check out the additional info you provided. Thanks again for reading my site and for your comment. Hi everyone, this is by far the best stuff I found about Amazon link localization. I run 2 of the biggest accounts for Amazon Spain, and this is a big issue for us (since we Spanish marketers do have a lot of visitors from LatAm countries due to language coincidence). I’ve tried some of the solutions mentiones, and I’d like to share my view point as a publisher. First of all: When running big sites, it is mandatory to me that the solution works with pre-existing URLs, and also with internal cloaked links (not only with amazon.com/amzn.to). I just can change hundreds of thousands of links in my website, even if it’s a one time job. That was a main problem to me when trying Geni.us. I drop a few emails to Jesse and he was really kind and clear, but he also told me that the were not planning to change this in the near future. Second: most of the solutions in the industry seem to be focused on the United States market, which certainyl makes sense. But it doesn’t fit for Spanish marketers at all. Our big deal are latam visitors (Argentina, Chile, Colombia, Ecuador…) which DO NOT HAVE local store on their countries. This is the main point. BestAzon.io is the most clear and straightforward solution to me, at least among the ones I have tried. But it does not work properly for these countries. It uses a geographical neighboring system, which works great for most cases (e.g: Ireland redirects to amazon UK) but not for Latam countries. Due to proximity, every LatAm visitor is redirected to either Amazon Mexico or Amazon Brazil stores. This is a bust for us, since Mexico and Brazil Associates systems are restricted only to native people. Other tools choose to stay with the default store when detecting a country which doesn’t have a local store. In my case, this means that Argentina, Chile and Colombia visitors are sent to Amazon Spain. Of course, they are not bying anything at all there. So I am still searching for a solution that allows me to send LatAm visitors to Amazon.com, and that works with any type of pre-existing links, including cloaked ones. I am open to further discusssion on this. BTW, I wrote an email to Rachel from BestAzon yesterday, hoping we can’t get in touch soon. Thank you kindly for the mention and consideration around the Genius Link service (geni.us)! We are honored and wanted to take a moment to share a few notes with you and your readers. Please let us know if you have any other questions / comments and I look forward to the possibility of working with you in the future. If I may, there were a couple things I wanted to mention in regards to your article that I thought were worth elaborating on. I think this is a super important point that most people don’t initially consider and unfortunately, once you’ve pissed off Amazon and been banned from their program it’s hard to get back on their good side. While this is no substitute for thoroughly reviewing the multiple documents that make up the Amazon Operating Agreement, the gist is that when using a link globalization service one “Should be clear that the client is going to Amazon either through visuals or some other indicator”. 1.) There is not always a direct correlation between your traffic to a site and the clicks on your links. Residents in some countries have been subconsciously trained NOT to click on your buy links because the buying experience has traditionally been very challenging (not available to ship to their country, expensive, long shipping times, etc.). So you’ll see they don’t click as often. 2.) On the same note, not all countries have an Amazon Store that easily services them. Amazon has 14 storefronts and 12 international affiliate programs. Unfortunately, your #2 (Philippines) and #5 (Ecuador) countries don’t have Amazon storefronts that are optimized for them. 3.) Amazon.com has the largest catalog of products. Unfortunately, not all of the products you recommend are going to be available in the other international storefronts. This is especially true of the Amazon Brazil storefront as it’s a “digital only” storefront (no physical products). 4.) Not all of the affiliate programs will payout internationally which makes it hard to realize any commissions you’ve made from using their affiliate programs. You can get paid out internationally from the affiliate programs in the US, Canada, UK, Germany, France, Italy and Spain. You can NOT get paid out internationally for the affiliate programs in Mexico, Brazil, India, China, and Japan. Though Japan will payout in gift cards which can be really fun (we use the gift cards for holiday presents for the team, notes here: “Amazon Associates: Cash in Your Amazon Japan Gift Cards” (http://blog.geni.us/2015/11/19/amazon-associates-cash-amazon-japan-gift-cards/)). 5.) Not all of the Amazon storefronts have an affiliate program. For example your #7 (Australia) and #9 (Netherlands) top countries have their own Amazon store but no affiliate program so you aren’t able to earn commissions there. While you may not be able to double your commissions I still strongly encourage you to still globalize your links because 1.) it’s money you are leaving on the table and 2.) it’s good for your readers. Uptime and speed are incredibly important for us. As you likely saw from our blog (“[Technical post] Geniuslink’s Full Tech Stack” (http://blog.geni.us/2016/02/25/the-geniuslink-technology-stack/)) we have put a lot of time and money into our infrastructure. This isn’t cheap which is one of the reasons are service has a monthly cost – ensuring you are always getting the best infrastructure. Details here: “1 Year Old Amazon Affiliate Website Making $3,000 a Month: A Step by Step Case Study” (http://www.nichepursuits.com/amazon-affiliate-website/) and “16 Quick and Simple Ways to Increase Amazon Affiliate Earnings” (http://www.nichepursuits.com/increase-amazon-affiliate-earnings/). However, it’s important to note that you can use both EasyAzon and Geniuslink together (notes here: “Geniuslink and EasyAzon 4” (http://blog.geni.us/2015/11/20/geniuslink-vs-k-and-easyazon/). While I’m probably splitting hairs here I want to briefly comment that by default the plugin will “honor existing parameters” which means that the affiliate parameters that are included in the link will be used when the link doesn’t need to be translated so you should never lose money using our plugin even if you don’t have a Geniuslink account synced with it. While this is partially true we actually work with a large number of musicians / record labels and authors / book publishers that are way more concerned about selling their music / books to a global audience than the affiliate side of things so the Amazon Link Engine very quickly / easily allows exactly that. As per your request and as a student of “intelligent links” I wanted to share some feedback. Bestazon.io – I recently came across this service due to the same reason, their comparison with us. Unfortunately, not a single “fact” on that page is accurate (and from my knowledge, their comparisons against some of our competitors are also flat out lies). Because of this I would be very skeptical of anything they do. Along the same lines, we took a brief look into their business model and I think it’s worth commenting that the automatic 3% of clicks that are affiliated with their tracking ID is against the Amazon UK TOS (we found this out the hard way years ago…). Viglink – Another great company with a great team, also doing some really innovative things. We also work closely with Viglink but not specifically with their Amazon clicks / links. A-FWD (https://affiliate-geo-target.com/amazon.html) – While UI isn’t their strong spot they have been around quite a while and slowly but surely are evolving the service. However, it’s important to note that their revenue model is also a violation of the Amazon UK Operating Agreement by overwriting 1 to 5% of your clicks with their affiliate tracking ID. We actually did a fairly indepth infographic and blog post about all of the services in the “intelligent link” space a year ago that you might find helpful: The Intelligent Link Landscape [+Infographic] (http://blog.geni.us/2016/03/25/intelligent-link-landscape/). 1.) Test the various options. Make sure to set up each test as carefully as possible but the beauty of using the Associates programs that provides a ton of quantitative data you should be able to see how well each service converted and your ROI. 2.) Take a close look at how the link “translation” is actually done. Most of the services are either swapping out the domain of the link (eg. Amazon.com → Amazon.ca) and hoping the ASIN stays the same or creating a search link for the foreign storefront using the title of product. Unfortunately, neither of these are full proof for all product types / stores, but that might not be a problem for you. Finally, programmatic link translation isn’t perfect so having the flexibility to override it when you need to can make the difference when you need to have your links be perfect for everyone. Hey Jesse – Thank you very much for the comprehensive and detailed response to my post. I’m very impressed with your speed of outreach (just published this post) and your transparency regarding competitors. I also appreciate the clarification on a few things I mentioned, which I updated the post to reflect.